Josh McCown threw for the highest regular season yardage in Browns history and led the team to a win over the Ravens, but still understands the draw to Johnny Manziel. 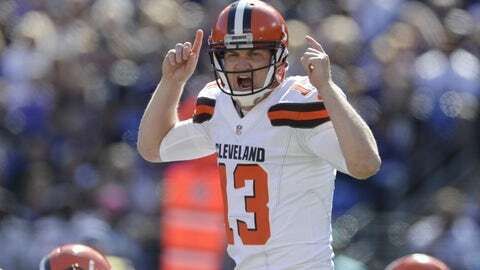 Ladies and gentlemen, your all-time Cleveland Browns regular season single-game passing yardage leader: Josh McCown.1 The 36-year-old journeyman threw for 457 yards, two touchdowns, and zero interceptions in the Browns 33-30 win over the Baltimore Ravens Sunday, leading the Browns to their second win of 2015 and knocking the Ravens down to 1-4. McCown’s performance caught the eye of Peter King, who devoted much of this week’s Monday Morning Quarterback column to McCown. McCown comes off as too good to be true, an unbelievably team-first guy, and King acknowledges as much. King adds, however, that McCown has made similar comments in his previous NFL stops, when he served as either a backup quarterback or a caretaker keeping the starting spot warm for a younger player; maybe he’s just a big sweetie. Johnny Manziel took over for McCown in the Jets game and led the Browns to a Week 2 win over the Tennessee Titans. Manziel played well in McCown’s absence, but the veteran started against the Oakland Raiders in Week 3. McCown’s recent passing numbers — he’s the first Browns quarterback ever to have 300-plus yards in three straight games — have quieted the calls for Manziel, but McCown says that he understands when fans chant JOHN-NY, JOHN-NY. “My wife and I went to couple of the [Cavs] NBA Finals games here in the spring,” he said. “We’re walking downtown and we thought, ‘Wouldn’t it be great if this would happen with the Browns?’ The energy, the passion, the drive. Per King, the Browns have called pass plays on 72 percent of their offensive snaps since McCown’s return in Week 3. The Browns projected to have a run-heavy offense, but middling play from the offensive line and running backs — along with a porous defense — have led to more pass calls by coordinator John DeFilippo. It may just be the afterglow of victory, but McCown paints a picture of a Browns locker room filled with belief. He makes it sound as though there’s no place he’d rather be than Cleveland — and he hopes to leave a mark before he’s here. “When I’m done,” McCown said, “I think it’ll sink in, and I’ll enjoy it. But we’re in the middle of something pretty cool here. We went to San Diego last week and had our hearts broken, and the energy in the locker room was so fantastic—we’ve got something good going here. Today we come back to Baltimore, and obviously it’s a team that’s been tough for us, but the energy was fantastic again. I just love being in there. I love being a part of the team. That’s what means something to me. Josh McCown is such a mensch. Bernie Kosar threw for 489 yards in a playoff win over the New York Jets in 1987.